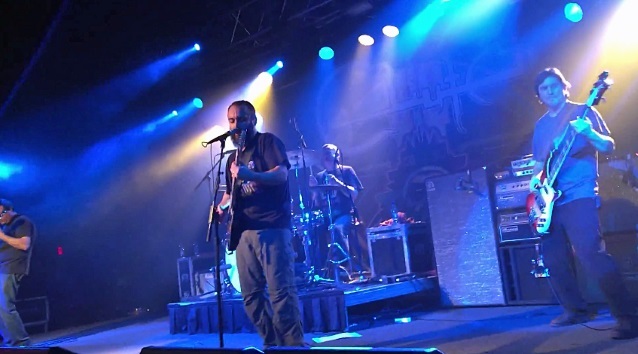 Fan-filmed video footage of Maryland rockers CLUTCH performing a couple of new songs during their December 29 concert at Starland Ballroom in Sayreville, New Jersey can be seen below. Asked about CLUTCH's plans for the coming months, CLUTCH vocalist Neil Fallon said in September: "We'll take October, November and December off to finish up writing and pre-production [for our new studio album]. And then we'll do a run from Christmas to New Year's to mid-January out to Texas, where we plan to record it. And then we'll record in January and February and probably the beginning of March, take a little bit of time off, and [get] back out on the road." Regarding whether CLUTCH feels the pressure to repeat the songwriting formula that it employed on 2013's "Earth Rocker", which sold 22,000 copies in its first week of release to debut at position No. 15 on The Billboard 200 chart, Fallon said: "I think the best thing is just following your gut. I think if we tried to make 'Earth Rocker 2', it would be D.O.A. [dead on arrival]. But then again, you don't wanna completely abandon it. "We started writing [material for the next album] pretty quickly. So it does bear a lot of similarities to 'Earth Rocker', just because we're just coming off the heels of that. If we waited five years, I'm sure it would be a different story." Fallon also spoke about the difficulty of coming up with fresh ideas without sounding like the band is rehashing previously used riffs and sounds. "We find ourselves, we'll play a riff and we'll say, 'We've heard that before' and discard it," he explained. "And that can be a good thing, and it pushes you to find something new. But at the same time, it's important to accept one's strengths. An example of that is a song on 'Earth Rocker', 'D.C. Sound Attack! ', that opening riff. We played it and we said to ourselves, 'We've done this before. It sounds too much like CLUTCH.' And [producer] Machine said, 'Well, you are CLUTCH, so really, what's the issue?'" CLUTCH released "Summer Sound Attack" — a 10-song compilation of their most popular songs for streaming and download on iTunes — via the band's label, Weathermaker Music. The collection includes "Electric Worry", "The Regulator", "50,000 Unstoppable Watts", "Earth Rocker" and many more key tracks from the seminal group. On June 10, CLUTCH released a triple deluxe version of its acclaimed "Earth Rocker" album via Weathermaker Music. The "Earth Rocker" triple deluxe album package includes: 1) the full record and brand new songs "Night Hag" and "Scavengers", 2) "Earth Rocker Live", a CD audio version of the album performed live; and 3) on DVD "Live In Denver" recorded with seven cameras in 1080i on November 14 at the sold-out Ogden Theatre show in Denver, two videos shot, directed and edited by actress Aisha Tyler: "Gone Cold" (unreleased) and "Crucial Velocity".